The CD100 is a mountable display with a keypad for data logger data entry and display. It has a vacuum flourescent display for responsive use through a wide operating temperature range. You can operate it the same as the CR1000KD. The CD100 has a 16-character keypad and a display that can show 8 lines by 21 characters (64 by 128 pixels). The keypad's design permits operation with a gloved hand. Security can be set in the data logger to prevent unauthorized personnel from accessing the data. The CD100 is both water and dust protected, providing an IP66 rating when installed in the enclosure lid. Menus for the CD100 can be customized to simplify routine operations. Viewing data, toggling control functions, or entering notes are common applications. Individual menu screens support up to eight lines of text with up to seven variables. 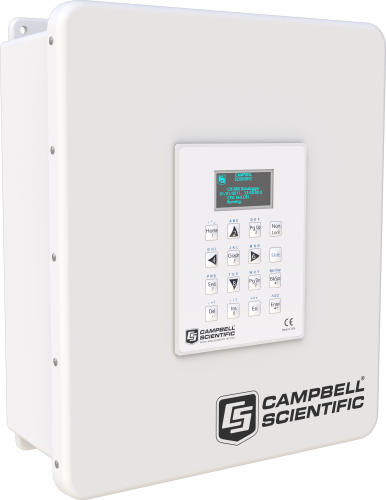 Power Requirements Powered from the data logger's CS I/O port. CR300 The CR300-series dataloggers do not have the necessary CS I/O port required by the CD100 for connection to the data logger. CR310 The CR300-series dataloggers do not have the necessary CS I/O port required by the CD100 for connection to the data logger.